iRealHousewives | The 411 On American + International Real Housewives: Yolanda Hadid Says She Wasn’t A “Very Good” Cast Member On RHOBH! Yolanda Hadid Says She Wasn’t A “Very Good” Cast Member On RHOBH! Yolanda Hadid reveals why she wasn't a good cast member on The Real Housewives of Beverly Hills. "I don't think I was very good at being on the show," she confessed to The Daily Dish podcast. "I just never felt I was good. I always felt I was struggling or trying to get my point across. But I did it to the best of my ability and I gave it my everything to stay on the show and try to work through it and do what I said I was going to do ... But I don't think I was great at it." She went on to say: "Fans, people probably love me because they identify with the experience that I went through. I think it's touched a lot of lives. In the midst of all the chaos, they were seeing me just try to get through my days." Yolanda cited her Lyme disease as a factor that made it difficult to continue on the Bravo hit reality show. "I had to choose for my health," she said, of her decision to leave the show after Season 6 in 2016. "A job is a job and I need to work and I wanted to stay on and I was like, ok I want to have one great season where I could share my heart and share my vision and way of thinking." Eventually, she realized she wouldn't be able to manage everything while battling an illness. "Thinking back, I've never been on the show in a normal frame of mind, having energy and getting up and going like, 'OK. I'm ready to attack this,'" Yolanda reflected, noting that she probably wouldn't have done the show if she knew she had Lyme disease before joining. However, Yolanda said, "I think being on the show has been a positive for all of us. Obviously, for me, it was a struggle dealing with that kind of a show, not having full capacity over my brain. But the other side of it, being on the show has been such an amazing experience; it's given me a platform to bring awareness to Lyme disease and help thousands of people out there that suffer from invisible illnesses ... For me, getting sick and being on the show was the higher purpose of my journey, and it fell into place to help the world with something needed attention and needed a face." Hadid also reveals which co-stars she still stays in touch with after her departure. "I only talk to Erika [Girardi]," she revealed. In fact, Yolanda said that she foresaw Erika's future as a Real Housewife and it prompted her to rally to get her to join. "I always get these crazy visions of things and I remember sitting [on] my living room couch with Erika and her husband and David and they were talking about a music career, and all of a sudden, I'm like, no, she has to be a Housewife," Yolanda recalled. 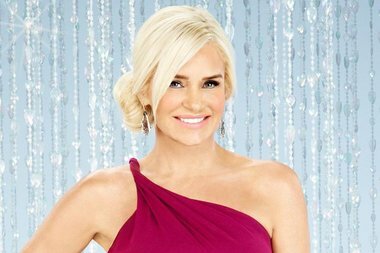 Yolanda shared that she was upfront with Erika about the realities of reality TV from the beginning. "This is the game and you can't take things [personally] when you go on a show like that ... Everybody's on their best behavior in the beginning and then as the season unfolds, everybody's just who they are," she said. "That's what makes it a great show." Listen to Yolanda's full interview below!